With 4G LTE broadband modem, the Industrial-grade 4G Router can achieve high speed and low latency. The high-gain FPR antenna ensures a better signal reception and allows the industrial 4G router to serve weak signal areas including countryside, coast, camping site and the rural regions. Supporting secure VPN communications, static and dynamic IP routing, port forwarding, and inspection firewall, the Industrial 4G Router provides safe and reliable internet services. The industrial-grade designed 4G Router can stand up to dirt, harmful ingress of water, humidity and extreme temperatures for years of dependable operation. 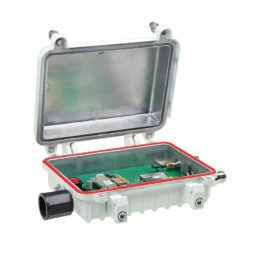 The rugged metallic case provided IP67 rated protection from dust and capable of withstanding water immersion between 15 cm and 1 meter for 30 minutes.